First published in 2000, this volume is a unique collection of essays which draws our attention to the importance of those textual elements traditionally ignored in literary criticism. These include punctuation, footnotes, epigraphs, typography, cover design, white space and marginalia; features which significantly affect the meaning of a literary text. The first section of the book opens with a proposal for a new theory of punctuation. The essays which follow are devoted to detailed interpretations of particular marks in the work of individual writers, including Spenser, Richardson and George Eliot. 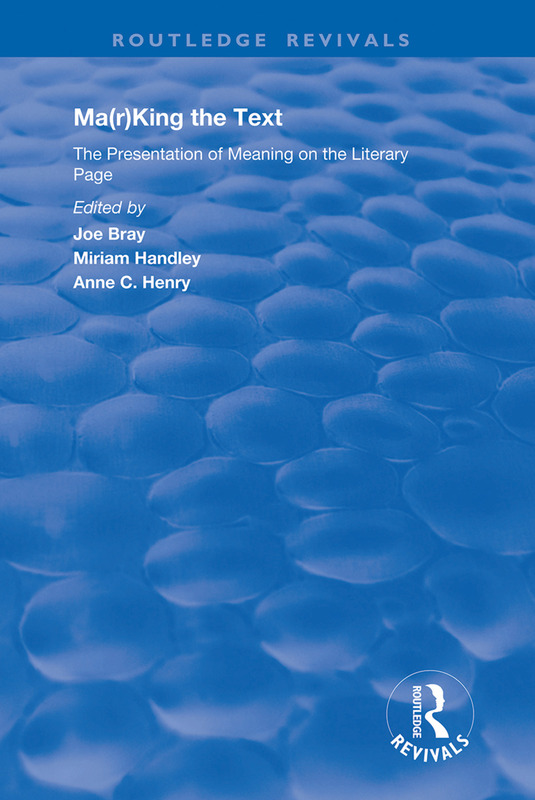 The consequences of this approach to the literary text are examined in the second section of the book, which begins with a debate on editorial practice and responsibility, and features insights from editors. Attention is drawn in particular to the special issues thrown up by dramatic texts, translations and electronic editions. The relationship of marks to the main text is far from subordinate, and we cannot appreciate the full interpretative potential of a text without considering this. The essays here compel us to assess the interaction of textual and literary meaning. To mark a text is to make it. Ma(r)king the electronic text: how, why and for whom?